A secret U.S. spy satellite launched into space atop a 19-story rocket Thursday (Sept. 13), ending a six-week delay for the latest clandestine space mission by the National Reconnaissance Office. An Atlas 5 rocket launched the new NROL-36 satellite and 11 tiny research satellites into orbit from a pad at Vandenberg Air Force Base in California. The rocket lifted off at 2:39 p.m. PDT (5:39 p.m. EDT/2139 GMT) following weeks of delay due to launch range issues. "Liftoff occurred right on time at the top of the window," said launch commentator Don Spencer of United Launch Alliance (ULA), the company that oversaw the NROL-36 flight for the National Reconnaissance Office (NRO). Because the NROL-36 satellite's mission is classified, it entered a media blackout 4.5 minutes after liftoff. 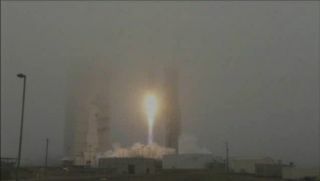 The NROL-36 spacecraft's national defense mission is the fourth and last flight of 2012 for the NRO, which builds and operates the United States' spy satellites. The mission was initially scheduled to blast off Aug. 2, but it was delayed due to concerns over the launch range equipment designed to track the Atlas 5 rocket during flight. The rocket and spacecraft themselves never experienced any technical issues. Thursday's launch also lofted 11 tiny satellites, or "cubesats," that tagged along with NROL-36 during its flight into space. The cubesat missions were sponsored by NASA and the NRO, ULA officials said. "The cubesat missions will study space weather and communication, the space environment, debris mitigation, maritime shipping container tracking and spaceflight safety, and orbit refinement," Spencer said. The cubesats were developed by the Air Force's Space and Missile Command, Aerospace Corporation, University of Southern California, University of California-Berkeley and the Lawrence Livermore National Laboratory, according to a ULA mission description.